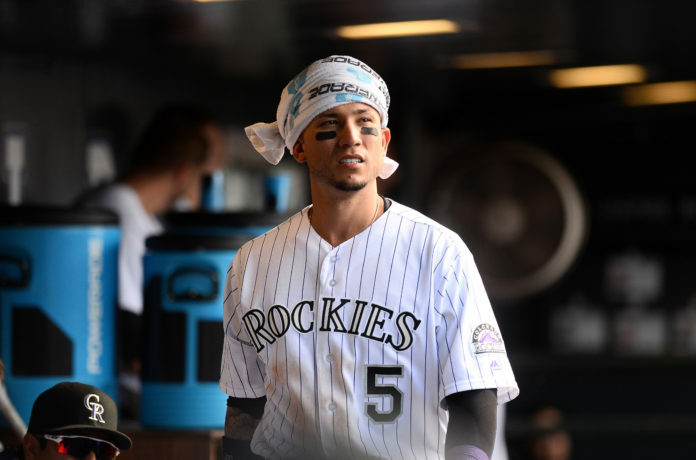 Troy Tulowitzki may have been the story going into the game, but the Rockies made sure there was no love lost by coming back from a four-run deficit to win Monday night in Tulo’s return to Coors Field. Tulowitzki was quiet in his first career game in Denver as an opponent, going 0-for-4 with a strikeout. The Rockies have created their new normal without one of the franchise’s biggest leaders by winning by committee. There were plenty of long balls hit Monday – including three by Toronto – but it was a next batter up, by any means necessary mentality that won the game for Colorado. That doesn’t mean the Rockies’ current star couldn’t get the offense started with a bang. Down 4-0 with Blue Jays starter Marco Estrada dominating the Rockies lineup through five innings, Carlos Gonzalez made the fans cheer louder than they ever did for Tulowitzki in his return by hitting a three-run homer. The blast sparked the offense, which scored nine runs in two innings. With his 17th home run of the season, his 189th career home run in a Rockies uniform, Gonzalez surpassed Tulowitzki for fifth place on the club’s all-time home run list. How nice was it to pass Tulo, while he was in the building? Rockies starter Jon Gray adapted to the high-energy atmosphere and pitched better than his four-run line suggested. He earned the win by going seven innings, striking out eight with no walks. Gray said he felt back to normal after his last start where he left the game in the fifth inning with arm fatigue. Gray took it light this week and did not throw very much to be prepared to start the game. When asked about the atmosphere in the stadium, Gray said it was nothing compared to his major league debut. Gray was pinch-hit for in the seventh by another pitcher. A short bench with injuries to Trevor Story and DJ LeMahieu forced pitcher Tyler Anderson to the plate down by a run and needing to advance a leadoff baserunner. He made Walt Weiss look like he knew what he was doing all along by advancing Brandon Barnes with a two-strike bunt. Weiss said that he didn’t want to eliminate his only real pinch-hitting option, Ryan Raburn, that early in the game. Trailing by one, if he put Tony Wolters in the game, he would have to sub in at defense. Anderson said he was a little surprised his name was called but the coaches told him to be ready for anything being short-handed. With two strikes and and a runner on, down a run, the Rockies needed a sac bunt more than anything. Anderson’s composure in the batter’s box mirrored his solid starts so far in his young career. He got the job done. The next two batters, Charlie Blackmon and Cristhian Adames were hit by pitches to load the bases for Nolan Arenado. The new face of the franchise since Tulowitzki was traded singled home two runs to give the Rockies a lead they would not relinquish. Gonzalez returned to the plate and singled to re-load the bases before Mark Reynolds drew a walk to score a run. Two more Rockies would hit safely in the inning, including a double by Barnes who got the rally started with a leadoff single, before Weiss was forced to actually use Raburn and pinch hit for Anderson. When the dust had settled the Rockies had plated six runs in the inning and the rout was on. Not a single ball left the yard in the six-run seventh. Compare that to Toronto, who scored four of their five runs off home runs. Pinch-hitting for a pitcher with a pitcher. Taking one (or two) for the team. Situational hitting. Bases loaded walks. Next batter up and by any means necessary. That’s how the Rockies won on Monday, and how they can win in the absence of Troy Tulowitzki.